Sen. Susan Collins, R-Maine, and other senators arrive to vote on a bill on Capitol Hill in Washington, May 23, 2018. 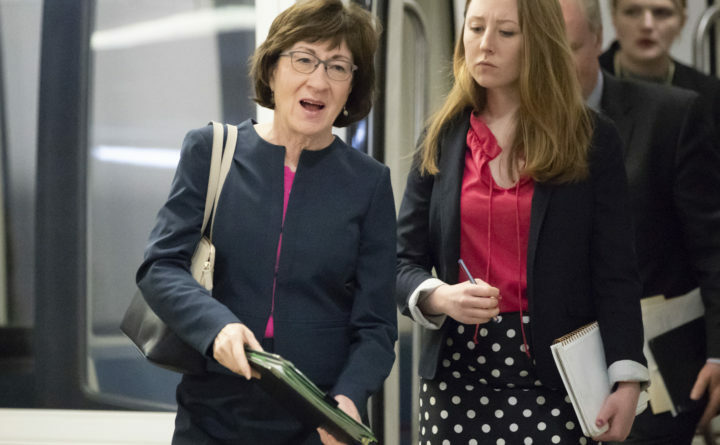 Republican U.S. Sen. Susan Collins said she opposes the Trump administration policy that has separated at least 2,000 immigrant children from their parents at the Mexico border, but that she is not on board with a Democratic bill that would force the administration to abandon a policy that has produced widespread condemnation. Collins’ position contrasts with independent U.S. Sen. Angus King. While both senators are condemning the Trump administration policy that was announced by Attorney General Jeff Sessions in April, King supports Senate and House versions of the Keep Families Together Act, a proposal that would force the administration to end the separation policy. The proposal has garnered support from Democrats, but so far, no Republicans. Collins said the better path would be try again to pass the bipartisan immigration bill that failed to move forward after a procedural vote in February. Collins also called on the administration to terminate the practice of separating children from parents who enter the country seeking asylum at legal crossings unless they are abused. She and Arizona Republican Sen. Jeff Flake have written to the administration to request more information about the effects of the separation policy. Collins also suggested that the number of children separated from their parents could be higher than Homeland Security has reported. King and Democratic U.S. Rep. Chellie Pingree have both signed onto the proposal that would end the separation policy, while Collins and Republican U.S. Rep. Bruce Poliquin are backing a comprehensive immigration overhaul, a pursuit that has sharply divided Republican members of Congress. The House is expected to take votes on two competing proposals, among them a hardline bill that is not expected to pass. The other bill, which funds the president’s wall along the U.S.-Mexico border and includes a pathway to citizenship for young undocumented immigrants brought to the U.S. as children, is touted as a compromise between moderate and more conservative members of the GOP. Last week, President Donald Trump said he wouldn’t sign either bill, a declaration that cast doubt over passage of either proposal. On Monday, the president also falsely asserted that the separation policy is the result of a law previously passed by Democrats in Congress. The policy is not a law, and it was instituted as a directive by Sessions on April 6.